In the 1970s, when GO Transit was a small-scale operation on the Lake Shore corridor, the focus of commuting was downtown Toronto with smaller nodes at Toronto International Airport (the name “Pearson” would come in the 1980s) and at Hamilton. Much of what we now call the GTHA was still farmland. By the new millenium, many jobs, but equally importantly many homes, were to be found in the outer part of Toronto and the regions beyond. This produced travel demands not just for commuting, but for all types of travel in areas poorly served by transit. Even within Toronto, the network design focused on moving riders to the subway and thence to the core area for work and school trips. Over the past two decades, suburban commuting demands have become more complex as more and more jobs spread over the area, and the many-to-many travel pattern is almost exclusively served by autos. The charts above would be more informative if the thickness of the arrows were proportional to the volume of travel, and if separate maps broke down this information by transit and auto modes. This would show the degree to which the planned transit network does or does not actually address growth in demand across the region. A related problem is that the transportation network will continue to be dominated by its origins as a downtown-centric system. Moving hundreds of thousands of people to a small part of the GTHA is easy work compared to linking homes and jobs across the huge region. Moreover, there is no guarantee that populations will conveniently shift themselves in alignment with the new corridors. This is a classic problem of “transit oriented development” – we always build transit long after auto-based travel patterns are established. New development may spring up on a proposed corridor, but that corridor must compete with a backlog of transit needs. The heart of the problem facing Metrolinx (and all of us) lies in directing land use and the disconnect between plans and actual development over long time periods. Over the next 25 years, the population of the GTHA is expected to grow to 10.1 million people and the number of jobs is expected to rise to 4.8 million. The population and employment growth as forecasted in the Growth Plan for the GGH is shown for GTHA municipalities [below]. While most of the growth in people and jobs will continue to occur in GTHA municipalities outside of Toronto, recent trends indicate that significantly more growth is expected to take place in Toronto than was forecasted, particularly in the downtown area. Suburban centres outside of Toronto, including designated Urban Growth Centres, may not see the concentration of growth envisioned in the provincial Growth Plan. Outside of Toronto detached and semi-detached homes are expected to continue to dominate the housing market. Nonetheless, higher density housing forms are becoming increasingly common in these areas, and a few significant urban centres outside of Toronto are starting to emerge. Office employment, which is a major driver of transit use, is becoming increasingly concentrated in downtown Toronto and in a few large suburban employment centers (see Figure 7). Importantly, significant employment is also occurring outside the designated Urban Growth Centres and away from existing and planned rapid transit services. Suburban employment areas continue to be designed around the car, and are difficult to serve by transit and to navigate on foot or by bicycle. The GTHA’s population is expected to grow by 49 per cent by 2041, and with it, so will the travel demand. Within the City of Toronto, the increase will be about 25 per cent, but the jump will be much greater for trips between the “416” and “905”, and even greater for trips entirely outside of the City. The charts above show just how badly suburban travel has been served by transit in that by 2011 there were already more peak trips outside of the City than all of the travel forecast within the City for 2041. 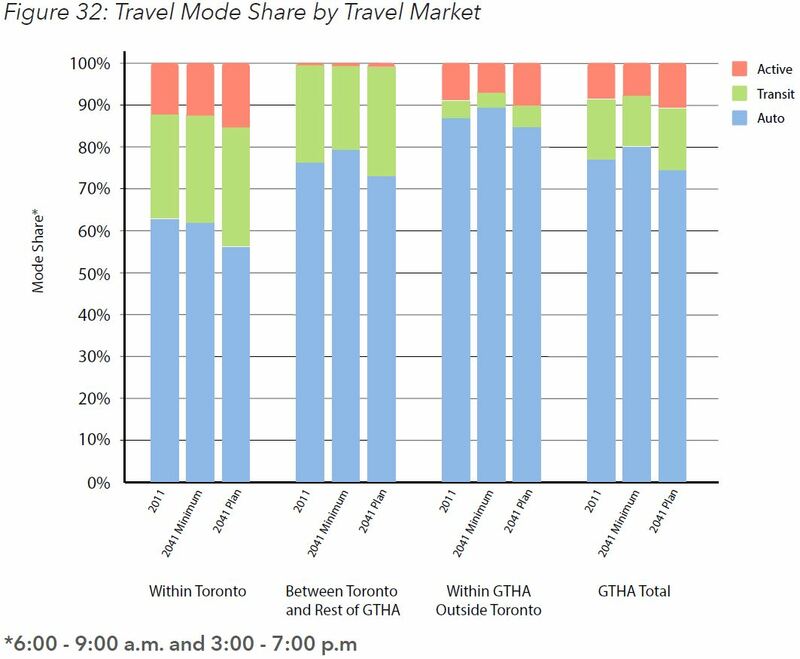 Almost none of this is served by transit as shown by the tiny green (transit) sliver of the 2011 mode share for these trips. Transit trips are expected to grow by 55 per cent in the GTHA overall. This is only slightly more than the growth in population. In absolute terms, the greatest growth in trips will occur within the City of Toronto with lesser contributions from 905/416 cross-border trips and an even smaller growth in the number of outside-416 trips. Transit travel times will be marginally better, notably for cross-border trips, but this depends on the full implementation of the 2041 plan. In the charts below, the “2041 Minimum” option would only add a few lines to those already under construction. The present and future networks are summarized in the maps below. These maps contain subtle choices in the display of information that are quite misleading. On the first map, the term “In-Delivery” implies that all of the lines on the first map will actually be built in the near future, but the status of projects varies from about-to-open (the Vaughan subway extension) to unfunded-and-unloved (the Sheppard East LRT/BRT). The new freight bypass south of Brampton will be an important component of unlocking capacity in the rail passenger corridors, but its construction could be as far off as the Downtown Relief subway which is not even on this map. However, two projects in Scarborough are listed as “less than 10 years” from opening and that takes us to at least 2027 if not beyond. The Scarborough Subway is known to be at least a 2026 project, and the Sheppard East LRT does not even have funding and faces an uphill battle against those for whom only subways are good enough. On the second map, projects “In Development” include the DRL on which $150 million has been allocated for design work, but actual construction will present severe sticker shock. The only reason the DRL gets any attention is that York Region’s dream of a Yonge Subway extension cannot be built unless the capacity problems further south are resolved. Metrolinx projects that the jobs will be more accessible across the region, but the maps are misleading. The biggest problem with these maps is the use of a 60-minute screen in a region where the average commute, especially by auto, is considerably smaller. Moreover, there is no indication of the starting location for these trips, and the maps will be very different depending on whether one begins at Yonge and Eglinton, Malvern, Central Mississauga, Hamilton, Richmond Hill or Oshawa. The chart tells a very different story. Between 2011 and 2041 the number of people in the GTHA will rise from 7.2 to 10.1 million. Although a larger proportion of them will be in “walking distance” to frequent transit, the percentage will be under 40 per cent. This is four times the proportion in 2011, a value so low it is no surprise that the dominant form of travel is auto, but a majority of the population remains beyond an easy reach of transit. The situation for jobs is slightly better, but still over half of the region’s jobs will be beyond frequent transit. There is a disconnect here in that job locations will be proportionately better served than home locations making access to transit for many workers challenging, and reinforcing the notion that transit is not a reasonable alternative for many. Moreover, the maps and charts say nothing about income distribution and the degree to which lower income residents who are more transit dependent are forced to live in areas with poorer transit and longer commutes to jobs. This is mentioned in the text, but not underscored in the presentation. A pair of diagrams is intended to show what transit-oriented street design should look like. This is nothing new to anyone who thinks of what actually getting to a rapid transit station entails. In “old” cities, a dense grid of streets places a large area within “walking distance” of a node, whereas in “modern” suburbs, large areas can be cut off from transit through inward-facing development patterns that turn their back on main streets. However, there is are fundamental problems with these pictures, well-intentioned though they are. A great deal of the GTHA, certainly those areas around probable rapid transit nodes, is already developed. The opportunity to retrofit an “urban” grid on these areas is limited. The diagrams do not show the effect of that plague visited by GO Transit on the region – parking lots that sterilize large tracts of land closest to stations. Metrolinx proposes an overlay of various service types to build up a Frequent Rapid Transit Network. Right at the bottom of these layers is the local transit network, an essential part of making the entire thing work. However, this is a rare acknowledgement in the overview presentation, and it gets little more in the full Draft Plan. The proposed 2041 Frequent Rapid Transit Network covers a great deal of ground, but the lion’s share of this is “Priority Bus”. Just how much “priority” those buses will get, let alone how frequently they operate, is a matter of some conjecture. “Frequent” is defined as service every 10 to 15 minutes, and this is on a fairly widely spaced grid of routes. When people think of transit in areas where it has a substantial market share, they think of much more frequent service. We are nearly a century removed from the TTC’s early goal of “always a streetcar in sight”, but to be a credible alternative transit must not involve long wait times. The grid nature of the FRTN and its dependence on local feeder/distributor services will inevitably impose one or more transfers in a typical trip, transfers that could occur on windswept roadways, not in the relative convenience of subway terminals and junctions. Little of this has committed funding, and the amounts involved are routinely portrayed in some political circles as waste, not as investments in the region’s future. There is little guarantee that all of the network will be built, and there is certain to be a long interim period where there are many “missing links”. The level of service on the incomplete network, and especially on the local transit layer, is likely to be poor, operated at a level to just handle the demand that shows up, not as a real encouragement for auto users to switch to transit. The priority for spending on the many components will be influenced by political considerations, and the order of construction may have more to do with ego and influence than with real need. Absent in the overview and in the larger Draft Plan is any definition of just what each component of the network will achieve. Are the lines needed today, or for future demand? How much effect will various components have on the auto/transit market split? How much more would be needed to improve that split? How much local service will be needed to make each part of the regional plan viable? The Draft Plan contains five strategies, each with its own set of goals. Exactly what “advancing” projects in development entails is hard to determine. They occupy a position in the maps above implying some degree of priority following works already underway, but “advancing” them will not bring service to our local stops any time soon, if ever. As for HSR, that scheme has the flavour of yet another provincial boondoggle written all over it unless the focus is on providing service the region actually needs rather than building and operating a prestigious toy train. The memory of UPX and claims made for that service should warn of what can happen when politicians meet signature projects. This is an odd set of goals in that a 24 hour network requires an underlying set of connecting services at least as much as the daytime network to make it accessible. As for airports, they are nodes to be sure, but there is much more to the region than airports. That is quite a shopping list and it has least two clear subsets, one of which is very road oriented. It is amusing to see transportation demand management here because this has been talked of for years. The problem, of course, is that travel demand grows faster than anyone’s attempt to “manage” it, and it is unclear just how this would be achieved beyond the basic aspect of throttling capacity. Goods movement has been talked about since the dawn of Metrolinx, but almost nothing has been achieved, in part because the infrastructure involved is really not part of Metrolinx’ mandate. A fundamental conflict that the Ministry of Transportation must address is this: who are roads for? Are they for the ever-growing commuter demand, or are they to move goods? How much of the local street systems throughout the GTHA can be given over to freight as opposed, broadly speaking, to passengers? Is economic growth constrained by the capacity of the road network and the many-to-many demand patterns of freight movement, and what if anything can relieve this? First and last mile choices are important, and they involve many modes: walking, cycling, auto parking, kiss-and-ride and local transit. As the network grows and stations proliferate, it is simply not practical to deliver everyone to and from the core network by car, let alone to store those cars all day long. Recently there has been talk of self-driving vehicles as a “solution” to this problem, but those vehicles (leaving aside technical issues) still require road space, and they have to be stored and maintained somewhere. Are they part of a future transit system, or something we leave to the “private sector” to finance with varying degrees of long-term commitment? Will there be road capacity for all of the trips to and from transit stations? 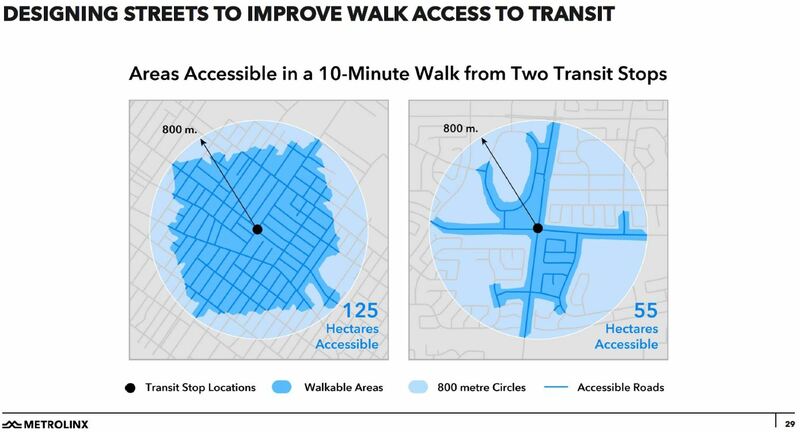 How much of the access can be provided by conventional local transit service, and who will fund this service? This chart implies a growth in parking spaces by about one third to 2031. Some of this construction is already underway, and there is no sign of Metrolinx shifting away from this tactic, notably in their designs for proposed new GO and SmartTrack stations. A vastly larger growth, twice the capacity of all existing parking in 2011, is foreseen for other modes of access. Metrolinx has yet to explain just how this would be achieved. Much of this section draws on goals that have been heard commonly in planning circles going back to the dark ages well before the internet, a time when vast areas in the GTHA were farmland, or possibly aging industrial areas that might be repurposed. Although some new communities can be built in keeping with these principles, a great deal is already in place and as a proportion of the total area, development built to these goals will not move the averages very much. Redevelopment of some areas around transit stations is possible, but this will be very ad hoc as large sites become available. This is an even more nebulous set of goals because they depend on technology changes that are still in play. I must return to the basic fact that the majority of regional travel will not be served by transit, and that the number of trips in this category will rise in coming decades. This is not a question of tagging an autonomous fleet onto the transit system for last-mile trips, but of well over half of all travel outside the City of Toronto. Moreover, autonomous vehicles will not do much to squeeze more capacity out of the road network. Metrolinx flags the need for sustained funding, but with a noticeable omission. The Province has made an unprecedented investment, more than $30 billion, in the region’s transit infrastructure. While this committed funding will cover the capital costs of building the 16 additional rapid transit projects that are targeted for completion by 2025, it does not include maintenance and replacement costs. Additional funding will be needed for new rapid transit projects after 2025, along with the complementary and supporting initiatives that are needed to optimize the transportation system, working collaboratively with other levels of government. The question of funding the local transit network which is an essential underpinning to the rapid transit plan is only alluded to within “optimization” of the transportation system, and yet this will bring substantial costs that are now borne substantially by municipalities. Better local transit funding will be a hard sell in areas where the transit market share is projected to improve only slightly from minuscule. In future articles I will turn to specific sections of the plan, but for now other issues and activities will draw my attention. Responding to the Draft Plan is a challenge even for the merry band of transit advocates and critics, let alone for the wider population. 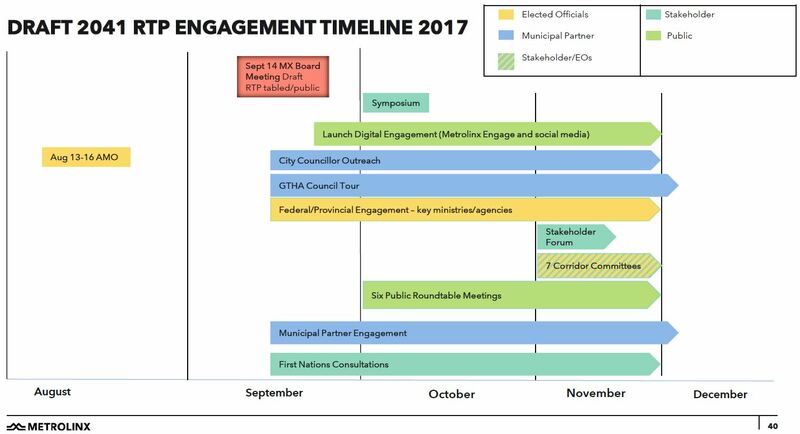 Metrolinx wants to finalize this plan for its December 2017 Board meeting, and yet a considerable amount of background material has not yet been published. There is a strong sense that Metrolinx simply wants their map endorsed before the 2018 election, and will leave the details for another time. The consultation plan is shown below. This entry was posted in A Grand Plan, Beyond 416, Transit. Bookmark the permalink. Hopefully there will be a post on Metrolinx’ Next Big Thing. That CBC article has much humour in it; mostly unintentional on Metrolinx’ part of course. Steve asks: “Should we laugh or cry?” I am afraid the latter seems more appropriate, the Waterfront transit “reset’ certainly seems to have accomplished VERY little except to postpone, yet again, actually building something. I love the Toronto obsession on consultation – and it can really improve projects of all sorts – but sooner or later decisions must be made and $$ must be allocated. Steve: And oddly enough, Metrolinx’ consultations are launched without a great deal of necessary background material available. They don’t want consultation, they want validation. Hilary Holden, another Toronto transportation official, said the Sheppard project is “paused” but still funded. Steve: That article is from February 2016. Hilary Holden has been working in the UK for about a year. The Sheppard East line has no money allocated – it has all gone to the Scarborough Subway. Thanks for your analysis. Makes for depressing reading – that the auto will not be replaced by good transit in the new draft plan. I can’t see how the implications of climate change, habitat destruction of other creatures living with us can allow this to continue. There is a wall somewhere, sometime that we are going to hit. It has already been hit in places around the world and close to home in the Caribbean, Texas & Florida as well as western North America. And the regular death toll from highway crashes, pedestrian & cyclist deaths will only grow after coming down when the super highways were built. I don’t think that most of these projects will remain on the books for long because with two Liberal corruption trials ongoing in the courts, a change in government is imminent and the Progressive Conservatives know nothing but to cut, cut, and more cuts. I had a very different reaction to the plan. As I understand it: a) over its 40 year history, increases in ridership have been very closely tied to GO Transit’s willingness to provide parking (see page 12 of its December 12/16 GO Rail Station Access Plan for an interesting chart); b) Metrolinx now intends to radically change this relationship and has planned for the park and ride share to plummet from 62% of weekday riders to 36%/38% in 2031; c) at the same time they forecast total regular weekday rides will climb from 100,000 in 2016 to 225/250,000 in 2031. 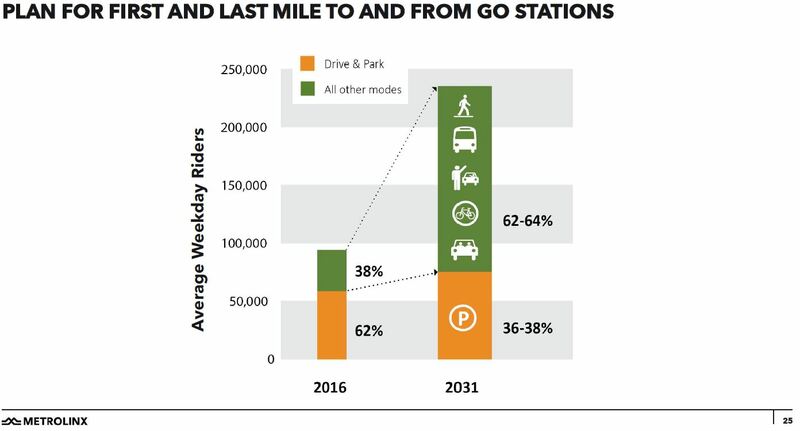 Combining both forecasts means that Metrolinx believes the park segment will rise from 62,000 last year to 86/90,000 in 2031, while the non-park group soars from 38,000 to 140/160,000. These numbers are very, very hard to believe. The practical problem is that most riders are unwilling to spend more than 15 minutes getting to the GO station – a figure that is impossible for most local transit authorities to manage for most customers. Theoretically Metrolinx could solve this conundrum by simply acknowledging that for many train users – especially most suburban riders – the automobile is an indispensable means of getting to the train station. The agency could opt to support its customers by say, running shuttles from off-site parking lots. However, I’m not optimistic. Elsewhere in the plan Metrolinx asks for new powers to control development and re-development around rapid transit stations in part to promote the Places to Grow program. If the Province grants the agency this authority, the agency will soon find itself in a conflict of interest between its classic role as a rail service operator and its new mandate as a high density developer/advocate. Thanks for all of this Steve, and pardon me for only giving it a once-over ahead of comment. There is a third aspect to the “dangerous situation” of the relative effort to stay in status quar (car) – the horribly ominous problem of climate change which we are doing relatively little about except making it worse. Transport leads our GHG emissions – again – and it’s growing, and we are not counting air travel in it all, though the laws of physics still prevail regardless. Both car-building and road-building are significant GHG contributors too; and we really have to measure all aspects of materials use soon, including in transit EAs. The ‘caronic’ denial of how devastating automobility really is will continue – odds are – as the bulk of the GTA population is more suburban and it’s just really hard to make transit so good in lower-density areas, unless there’s a LOT of back-stopping/subsidy. The transit subsidies are very transparent; car subsidies are buried, very thoroughly, in all sorts of varied budgets, so the tax fighters (alleged) can go after transit, but will usually ignore the costs of cars, including within the health care budget. vtpi.org could be a good resource. And as cars take up a lot of room on the road, the cost of providing all that asphalt is ignored, including land. Etc. etc. A very nice point on ignoring the actual people flows by mode: I’d love to see a people flow for the Lakeshore/Gardiner/King/Queen/GO corridor from the pinch point at the base of High Park in to the core. And providing a milk run and expecting that it will ‘solve’ this east-west issue, is pretty sad, but odds are, may be accepted. If we had people flow diagrams, we could also start thinking of new corridors, but also a newer way of thinking such as near-express routes. That’s what’s needed, along with preserving the rare chance of linear corridors when they appear, or actually investing in such things as that ‘missing link’ rail project to work on freeing up a valuable corridor near to Bloor etc. Steve said: The Sheppard East line has no money allocated – it has all gone to the Scarborough Subway. Steve: My understanding is that all of the monies once earmarked for Sheppard East have been reallocated to the SSE. This is all part of the big shell game that is Scarborough transit “planning”. Three Card Monte would be more honest. I am somewhat bothered, in that they do not appear to have the backing or direction from government to be part of a general change to zoning. The province needs to force a general change to zone in coordination with a rapid transit roll out, to actually really move the relative size of modes. Remove the requirement for 1 parking spot per use, reduce the residential to 1 car per residence, in areas supported by the new plans, and allow the market to price parking. Perhaps that will start to move people to transit, and get pressure aligned to help its development. Steve: Another issue is the generic description of additional density near “rapid transit stations”. That could be anything from Finch terminal to a surface LRT/BRT stop, but under the Growth Plan the “reach” is the same, a 500m radius from any station, and so is the target density. The plan was clearly drawn up thinking only of subway and GO stations. More fine “planning” from Queen’s Park. Really? I was under the impression those funds were allocated to the Finch west LRT? The Province has not committed any more money to the SSE as of yet than the original (1.4B plus inflation) to my knowledge. Yes, choosing to ignore there is a substantial difference between a busway, with a bus every 15 minutes, that heads to a GO station with service every 30, and a Subway stop on a line that leads directly to the core, or an LRT stop, on a line that transfers to a couple of others, has lots of employment along the way, and has a subway station on a line that goes directly to the core, as one of its stops.